Dalby /ˈdɒlbi/ is a town and locality in the Darling Downs region of Queensland, Australia. Dalby is within and is the administrative centre of the Western Downs Region. At the 2016 census, Dalby had a population of 12,719. Dalby is approximately 208 kilometres (129 mi) west northwest of the state capital, Brisbane, at the junction of the Warrego, Moonie and Bunya Highways. and the centre of Australia's richest grain and cotton growing area. At the 2016 Census, Dalby had a population of 12,719. Aboriginal and Torres Strait Islander people made up 7.0% of the population. 84.0% of people were born in Australia. The next most common countries of birth were Philippines 1.9%, New Zealand 1.3%, England 1.1% and South Africa 0.8%. 88.7% of people spoke only English at home. Other languages spoken at home included Tagalog at 1.0%. The most common responses for religion were Catholic 26.3%, Anglican 19.6% and No Religion 16.9%. Dalby was founded in the early 1840s at a place known locally as "The Crossing" on Myall Creek, a tributary of the Condamine River. The first settler was Henry Dennis, who explored the region and chose land for himself and others in the locality. Today an obelisk in Edward Street denotes the location where Dennis camped. A small settlement was founded to assist travellers heading north to nearby Jimbour Station. The explorer Ludwig Leichhardt visited the area in 1844, on his way to Port Essington. In February 1853, the New South Wales government sent the Deputy Surveyor General Captain Samuel Perry to the area to survey a township. In August of the following year, Mr Charles Douglas Eastaughffe arrived with a document under the Seal of the NSW Government officially proclaiming 'Dalby' a township. Mr Eastaughffe was later appointed Chief Constable and remained in Dalby until his retirement. The name of the town is believed to come from the village of Dalby on the Isle of Man and reflects immigration from the Isle of Man in the mid-19th century. The name was apparently chosen by Captain Samuel Perry when he surveyed the settlement in 1853. Myall Creek Post Office also opened in 1854 in Roche's store, with Mr Simpson as the first postmaster. It was renamed Dalby in 1855. In 1859, Dalby became part of the new state of Queensland. In August 1863 Dalby was officially proclaimed a municipality, the Borough of Dalby, in the Queensland Government Gazette. Dalby was linked by the Western railway line to Ipswich on 16 April 1868. From 1873 to 1949 the electoral district of Dalby was an electoral district of the Legislative Assembly of Queensland. Dalby was believed to have a healthy climate and in 1900 the Queensland Government built the Jubilee Sanitorium for consumptive patients. In 1904 the Dalby Town Council erected therapeutic thermal baths using artesian water from a local bore for those wishing to improve their health by "taking the waters". In 1938, the council closed the artesian baths as interest in "taking the waters" was declining. Medical opinion became increasingly doubtful of the benefits of bathing in mineral waters, favouring drugs and physiotherapy as better treatments. The Dalby War Memorial was unveiled by the Queensland Governor, Matthew Nathan, on 26 July 1922. Dalby Library opened in 2014. Dalby has a humid subtropical climate (Cfa in the Köppen climate classification) and being located just to the west of the Great Dividing Range it is hotter and less humid in summer and colder and drier in winter than nearby locations on the other side of the range. Dalby has had a recording weather station since 1893, but that was replaced in 1992 by another station at the Dalby Airport. The town's highest recorded temperature was 45.6 °C (114.1 °F) on 4 December 1913, while the coldest was −7.2 °C (19.0 °F) on 5 July 1895. The annual rainfall is 681.2 mm (26.8 in), the majority of which falls as thunderstorms in the summer months. Dalby experienced its worst floods since 1981 in late December 2010. The town's water purification system was flooded, resulting in water restrictions that have hampered clean-up efforts. 112,500 litres (24,700 imp gal; 29,700 US gal) of water were transported to the town of 14,000 residents. In early March 2013, Dalby received another severe flood, cutting the town in two after 122 mm (4.8 in) of rain was recorded over a few days. Flood waters peaked at 3.21 meters and a number of homes received water damage. Industry in Dalby includes large-scale engineering, coal mining, and fuels (ethanol). Dalby is the centre of a diverse and productive agricultural area with rich black soil allowing the production of crops such as wheat, cotton and sorghum. Livestock raising including pigs, cattle and sheep is also popular. Two cotton gins are situated within 10 kilometres (6 mi) of the town. Dalby is to be the site of the first dry mill grain-to-ethanol plant constructed in Australia (the first plant built specifically for the production of ethanol for fuel since the Second World War). The local area is developing an energy-based economy with a large coal-fired power station and a number of coal mines and natural gas bores being established to the west of Dalby. A local company has been awarded a contract to establish wind turbines on adjacent farm land. Approximately 50 kilometres (31 mi) west of Dalby is the Kogan Creek Power Station. This A$1.2 billion project is a 750-megawatt coal-fired power station, with adjacent coal mine being developed at the small town of Kogan, which is roughly equidistant between Dalby, Chinchilla, and Tara. Aerial view of the town taken in 2008. The opening of a shopping centre at the northern end of Cunningham Street has brought new life to the Dalby CBD. Dalby Shoppingworld includes Woolworths, Big W, Amcal and other speciality shops. Dalby's Water Treatment Plant uses a state-of-the-art reverse osmosis process, and will soon have a second RO plant to cater for the town's increasing needs. The town has made a ground-breaking deal with nearby gas companies by taking water from gas fields. It has been noted that the town will have a definite water supply for at least another 30 years, taking into account demographic trends. Dalby's population has been increasing rapidly recently with many new estates created and subdivisions made. Some notable new estates include Sunnyside Estate, Heritage Gardens, Callistemon Park and a new estate on the Warrego Highway side of Sandalwood Avenue. Dalby has a monument to the Cactoblastis cactorum in a park by the Myall Creek which runs through the town. The Argentinian caterpillar successfully eradicated the prickly pear in the 1920s. Dalby State School caters for students from Prep to Year 6. The school opened on 1 June 1881. It is one of the oldest state primary schools in Queensland. Dalby South State School opened on 29 March 1965 and it caters for Prep to Year 6 students. Dalby Christian College offers Prep to Year 12 schooling, Secondary Boarding, and an Early Learning Centre. The school opened on 1 February 1981. Dalby State High School has two campuses, Nicholson Street campus and Bunya campus. Bunya campus is a coeducational residential facility for Dalby State High School students. Bunya Campus was acquired by Dalby State High School at the start of 2011 and has since provided students who live out of the catchment area the opportunity to attend Dalby State High School and participate in all it has to offer as a boarding student. Nicholson Street campus, the original state high school campus opened in 2 February 1954. Our Lady of the Southern Cross College  Our Lady of the Southern Cross College is a Prep to Year 12 co-educational College. Prior to 2008 St Columba’s, established by the Sisters of Mercy in 1877 was the primary school and St Mary’s, established by the Christian Brothers in 1962 was the secondary college. The two schools unified in 2008 forming Our Lady of the Southern Cross as it is known today. There are two locally published newspapers including the Dalby Herald and Northern Downs News, as well as the Dalby Magazine. Dalby also has its own community radio station, 88.9 4DDD which was founded on January 26, 1992. Dalby receives most commercial and ABC radio and television services from Toowoomba, the nearest regional city. Local news stories from Dalby and other Western Downs communities is often featured on WIN News, a regional television news bulletin compiled in Toowoomba. Condamine has a rugby union team which compete in the Darling Downs Rugby Union competition, against such teams as the University of Southern Queensland Rugby Union Club, Toowoomba Rangers Rugby Union Club, Toowoomba City Rugby Club, Roma Echidnas, the Condamine Cods, the Dalby Wheatmen, the Goondiwindi Emus, the Warwick Water Rats and the University of Queensland Rugby Union Club (Gatton Campus). Western Downs Regional Council operates a public library at 107 Drayton Street. It is open 10am to 5.30pm Monday to Friday and 10am to 12.30pm Saturday. Dalby Library has 2 Creative Studios which have the latest in content creation tools, professional equipment and software, music production and recording, and digital production and editing to help create and share projects. The Springvale Kupunn branch of the Queensland Country Women's Association meets at 52 Cunningham Street. 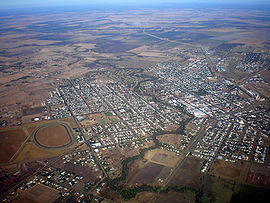 ^ "Dalby - town (entry 9213)". Queensland Place Names. Queensland Government. Retrieved 30 May 2017. ^ "Dalby - locality (entry 49866)". Queensland Place Names. Queensland Government. Retrieved 30 May 2017. ^ a b c d Penguin Books Australia (2002). Explore Queensland. Camberwell, Victoria: Penguin Books Australia. p. 40. ISBN 0-14-300015-2. ^ a b Dalby Town Council:Birth and beginnings Official website. Retrieved 27 October 2006. ^ "OPENING OF THE RAILWAY TO DALBY". Dalby Herald And Western Queensland Advertiser. III, (135). Queensland, Australia. 18 April 1868. p. 2. Retrieved 10 May 2017 – via National Library of Australia. ^ "Dalby War Memorial". Monument Australia. Retrieved 3 April 2014. ^ "Public Libraries Statistical Bulletin 2016-17" (PDF). Public Libraries Connect. State Library of Queensland. November 2017. p. 16. Archived (PDF) from the original on 30 January 2018. Retrieved 30 January 2018. ^ "Dalby Town Council Chambers and Offices (former) (entry 601018)". Queensland Heritage Register. Queensland Heritage Council. Retrieved 16 July 2013. ^ "St John's Anglican Church (entry 602399)". Queensland Heritage Register. Queensland Heritage Council. Retrieved 16 July 2013. ^ "St Columba's Convent (former) (entry 602761)". Queensland Heritage Register. Queensland Heritage Council. Retrieved 16 July 2013. ^ "Dalby Fire Station (entry 602754)". Queensland Heritage Register. Queensland Heritage Council. Retrieved 16 July 2013. ^ "Dalby State High School (entry 650036)". Queensland Heritage Register. Queensland Heritage Council. Retrieved 13 February 2018. ^ "Dalby War Memorial and Gates (entry 600441)". Queensland Heritage Register. Queensland Heritage Council. Retrieved 16 July 2013. ^ "Dalby Swimming Pool Complex (entry 602564)". Queensland Heritage Register. Queensland Heritage Council. Retrieved 16 July 2013. ^ a b "Dalby Post Office". Climate statistics for Australian locations. Bureau of Meteorology. February 2013. Retrieved 4 March 2013. ^ Trenwith, Courtney (30 December 2010). "Heartbreak beneath the flood slick". Brisbane Times. Fairfax Media. Archived from the original on 4 February 2011. Retrieved 4 March 2013. ^ "Drinking water trucked into flood-ravaged Dalby". Australian Associated Press. Herald Sun. 30 December 2010. Retrieved 4 March 2013. ^ "Dalby Braces for Flooding". APN. Sunshine Coast Daily. 2 March 2013. Retrieved 4 March 2013. ^ "Indicators of change in Dalby and district community" (PDF). SMI CRSM Centre of Social Responsibility in Mining. May 2016. Retrieved 19 January 2017. ^ "Dalby State School". Retrieved 23 January 2018. ^ a b c "Opening and closing dates of Queensland Schools". Queensland Government. Retrieved 18 April 2019. ^ "The oldest state primary schools in Queensland". education.qld.gov.au. Retrieved 24 January 2018. ^ "Dalby South State School". Retrieved 23 January 2018. ^ "Dalby Christian College". Retrieved 23 January 2018. ^ "Dalby State High School campuses". Retrieved 23 January 2018. ^ "Dalby State High School Bunya campus". Retrieved 23 January 2018. ^ "Our Lady of the Southern Cross College". Retrieved 23 January 2018. ^ ""Bundaberg Library (Public Libraries Connect)"". State Library of Queensland. Retrieved 30 January 2018. ^ "Dalby Library". Retrieved 23 January 2018. ^ "Dalby Library Creative Studios". Retrieved 23 January 2018. 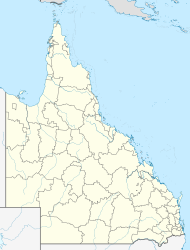 Wikimedia Commons has media related to Dalby, Queensland.